This Trip Packing Checklist, by Harley-Davidson is a long list of potentially packable items, grouped into several different categories. Items that might be considered "essential" are marked with an asterisk. Consider this list a starting point - a virtual pile on the floor. Then remove (or add) items according to your own needs and limitations. 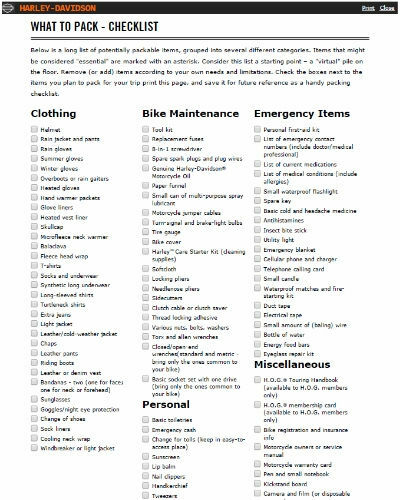 Print this page and check the boxes next to the items you pack for your trip. Then save it for future reference as a handy packing checklist. Download package in development.